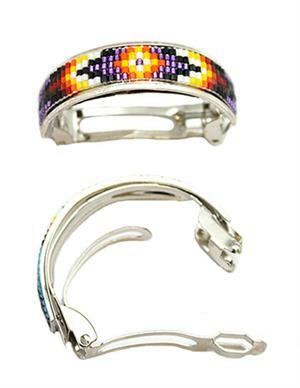 Sterling silver narrow piece with square wire border and 5 rows of assorted color cut beads on a base metal hair clip. It measures just under 1/2" wide. It is Navajo crafted by Lucille Ramone. Colors and pattersn will vary. Shown in different views in picture. Each one sold seperately, not sold in pairs.